The Ark contained a gold jar of manna, the ten commandments, and the staff of Aaron. cf. Heb 9:4 This is symbolic on a number of levels. Jesus comes as priest, prophet, and king; the manna is symbolic of the Eucharist; the commandments—His Word; the staff—His authority. Mary contained all of these at once when she carried Jesus within her womb. David went to bring up the ark of God from the house of Obed-edom into the City of David amid festivities. But pause for a moment and understand what Christ was saying: whoever does the will of God is… my mother. Who, of any other creature on earth, accomplished the will of God with complete submission and obedience more than His Mother? St. Paul wrote that, “without faith it is impossible to please him.” cf. 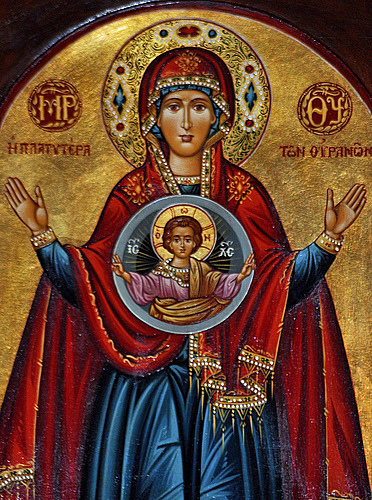 Heb 11:6 Who then would be more pleasing to the Father than Mary Immaculate? Rather than distancing Himself from her, Jesus was reaffirming precisely why Mary was more than the one from whom He took His very flesh and humanity; she was pre-eminent as a spiritual mother as well. Yet, Jesus expands motherhood to include all those who do the Father’s will. This is why the Church is also referred to as a “mother,” for she gives birth to new souls each day from the womb of the baptismal font. She nurtures them with the “manna”; she teaches them the commandments; and she guides and corrects by the staff of her authority. Lift up, O gates, your lintels; reach up, you ancient portals, that the king of glory may come in!